Take the leap and hop into the tropics with Hoppy Blonde Ale. This easy-drinking beer sips light and refreshing with a soft malt base, while vibrant notes of mango, lemon, blueberry and pine spring across the tongue courtesy of Mosaic, UK Admiral and Centennial dry-hopping. Light enough to session, but with a head rush of hops, Hoppy Blonde will leave you jumping for more. Dry-hopping adds more aroma and flavor without adding additional bitterness. Heat sensitive aromatic hop essential oils that otherwise were lost in the brewhouse are captured here. In this case: Mosaic: rich in mango, lemon, citrus, pine and blueberry and earthy; UK Admiral: hints of citrus with herbal and earthy flavors as well; Centennial: floral and citrus tones. Nice crisp and clean beer. Very drinkable with a nice bite from the hops but certainly not overwhelming. If anything the additional hops help make it a bit more unique compared to others in the category. Initially had a slight bitterness, but that went away after a few sips. Sweet fruity taste. Kind of watery. Overall an ok beer, but not worth a premium price. Pours a nice and golden hue. Wonderful smell, very fruity. Right on the money so far. Taste follows suit. Hoppy and citriousy with malt at the end as advertised. Light and crisp in the mouth. Good stuff, well done. Would I drink it again? Yes. 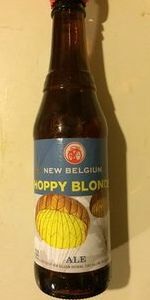 This is a wonderfully refreshing blonde beer with a lot to offer in taste, smell, and mouth feel. The orange and grapefruit flavors are followed by a tart bitterness you will enjoy. Of course, plenty of hops to go around. Head: White head with lots of bubbles gives away quickly leaving a light but sticky thin lace. Appearance: This baby pours a light yellow/orange and looks like a southern California sunset. The beer looks clean and crisp. Smell: Very aromatic with fruit and citrus on the nose. Heavy orange tones abound. Taste: You get the orange, grapefruit, rind peel, hops, and tartness of a quality beer. It is light bodied with a consistency of pour and mouth feel that is pleasing from beginning to end. Finish: Hoppy Blonde leave you with a tart swipe on the way out. It's lightly astringent and almost thirst making like the brewer wants you, no, needs you to drink more. Enjoy! This is the best new beer New Belgium has put out in a long time. Loaded with mosaic hops, giving it a fruity, pungent hop punch. Super-drinkable and perfect as a spring seasonal. Tasted in a pint glass from draft at O'Toole's on April 22, 2016. Amber, toasted malt, fruit. Pours a clear golden color with a thick foamy head. Head retention and lacing are both very good. Has a nice, fresh, citrus aroma with a good piney hop. Not very strong but is very evident. Pale malty taste with a good amount of citrus and mild piney resin at the end. Mild bitterness is just right. Light bodied with moderate carbonation. Not sure of the difference between this and a hoppier pale ale but it is definitely a great beer on a hot day. Pours a clear yellow with 1 1/2 finger head. Great head rentention. Smells of juicy and citrus. Very light mouthfeel. Tastes of pineapple and finishes with a small piney bite. I could knock back quite a few of these. Impressive, suuuuuuper drinkable. Poured from a 12 ounce bottle into a Shaker pint glass, "enjoy by" date 7-10-16. APPEARANCE: pours a clear golden color with less than one-finger off-white head that slowly dissipated until a thin, unbroken layer of small bubbles remained, there is significant lacing on the glass, medium carbonation. SMELL: sweet honey, bread, pine and some grapefruit citrus. TASTE: the taste follows the nose, initially sweet caramel then grapefruit citrus and finishes with a piney hop note, also has a dank earthy note at the end. PALATE: medium body and carbonation. OVERALL: this is a very good beer, true to it's name it was more hoppy than a traditional blonde ale, I enjoyed and would have again, this would have crossover appeal to anyone who enjoys pale ale or IPA or IPL. First had poured from 12-oz. bottle, stamped enjoy by "24 JUL 16," into faceted mug. With the malt backbone and nice hops, this Blonde drinks more like an American Pale Ale, which is not a bad thing.